Engineered for commercial fitness, perfect for home use. The Allegro Reformer, with over 43,000 in use around the world, has won rave reviews from Pilates instructors and fitness clubs for its ease of use, adjustability, safety and solid construction. Engineered and built for commercial fitness, the Allegro® is also perfect for home use. The Allegro Tower of Power is available with your choice of Allegro Reformers: Standard or Stretch. Stretch frame is 18" (46cm) longer than the standard Allegro—great for jumping! Carriage is 2" (5cm) wider and 6" (15cm) longer. An oversized standing platform is included. Additional footbar adjustments accommodate shorter users, too. 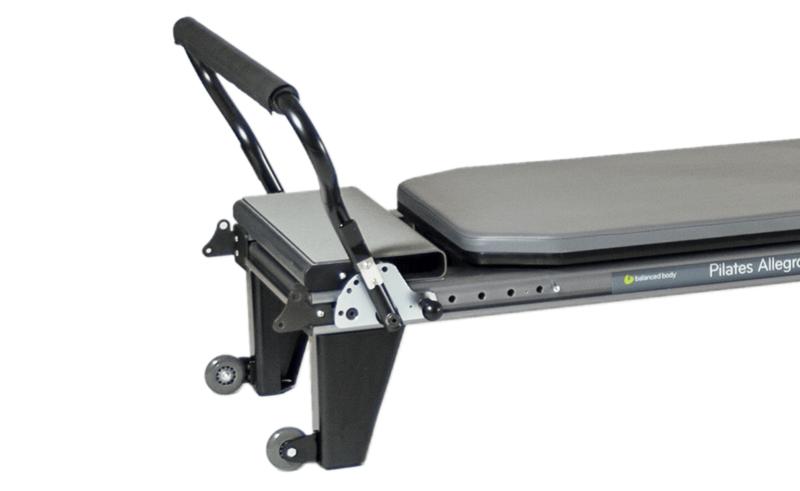 If for any reason you are not 100% satisfied with your Allegro® Reformer, simply return it to us within 30 days for a refund (less freight). Guarantee applies to U.S. domestic customers only. Build-in standing platform with non-slip safety surface. A complete Allegro Tower of Power® System includes an Allegro Reformer (your choice of a Standard or Stretch version), with legs to raise the Reformer height to 14" (36cm), plus a Tower and drop-in Mat. Purchase the complete system together and save. Components also available separately. Mat conversion is easy — just move carriage to the head-end and drop in the one-piece mat. Tower can be easily removed if needed. Convenient knobs allow easy lift-off removal of Tower if you want to stand your Allegro vertically for storage. Frame: includes built-in transport wheels and legs that elevate the frame to a personal training height of 14" (36cm). Anodized aluminum finish is sleek and durable. Carriage: smooth, quiet carriage ride is the result of our 8-wheel suspension system, featuring 4 custom-built vertical wheels to support the carriage, and 4 adjustable sidewheels to guide the carriage smoothly down the track. Footbar: 36" (91cm) wide, and the safest, widest available. Standard Allegro footbar has 4 locking vertical adjustments and 4 horizontal. The Stretch Allegro has one additional vertical and horizontal adjustment so that it accommodates average-height users as well as large and tall users. TwistLock™ shoulder rests: quick adjustments to 4 positions accommodate different users, or complete removal if desired. Ergonomic and sculpted for comfort. SoftTouch® rope system: easy to adjust and quiet, with no metal clips. Swivel pulleys allow variable angles of resistance. Built-in standing platform with non-skid finish. Standard Allegro platform measures 5" x 22" (13cm x 56cm). Stretch Allegro oversized platform measures 8.75" x 22" (22cm x 56cm). The most stable and secure tower available, with 22 spring attachment points. Three-sided push through bar in anodized aluminum, adjustable to two heights. Safety strap and carabiner. Eight Balanced Body Signature Springs™ for arm and leg exercises: Regular: 2 yellow (very light) and 2 blue (light). Long Springs: 2 yellow (very light) and 2 purple (medium). (4 regular, 4 long). Custom stability padding and heavy-duty vinyl upholstery. Choice of 35 custom colors. Stock color: Black. Upholstered mat is fast to install. Just move your carriage to the head-end of the Allegro and drop in the one-piece mat. Allegro footbars lock securely in place for safety, on both Standard and Stretch versions of the Allegro. These footbars are also the widest on the market at 36" (91cm) wide with a 30.5" (77cm) padded cover. Perfect for second position and tall users. Add great versatility to your Reformer. The foot strap is a great Reformer accessory. Retrofits for Allegro Reformers footplates.